The original link to the rest of the Moderator’s release was incorrect. We are resending this article so you may access the article directly. Please accept our apologies for this double-email. GENERAL CONFERENCE – WE’RE ALMOST THERE! I am asking every MCC church, pastor and member to keep in prayer our upcoming, historic General Conference in Latin America! We are also especially welcoming our brothers and sisters from “the Fellowship,” as we continue to work and collaborate in new ways. . . Even if you cannot attend stay connected with us daily, the week of June 28th through July 2nd by keeping an eye to the MCC General Conference Website for regular on-the-ground upates! In addition, the content of our daily Bible Study (brought to you by our Theologies Team) will be online, so you can download it and use it during Conference, or anytime thereafter. Pray for: revival, renewal, inspiration, for people to hear the call of God on their hearts, for a fresh anointing of the Holy Spirit, for good decisions, for unity in the midst of such wonderful diversity, for laughter and love and joy to abound. That our churches in Latin America have grown from 13 worshipping communities in 10 countries in 2007, to 42 worshipping communities in 14 countries and Puerto Rico, and the Dominican Republic today! Many leaders from these churches and emerging groups will be at our first General Conference in Latin America! We are excited to welcome Lt. Dan Choi, an activist fighting “Don’t Ask Don’t Tell,” the US policy that discriminates against lesbians and gays in the military. We returned from Haiti to the Dominican Republic this (7 June 2010) afternoon. The trip to Haiti was a very challenging one, and even dangerous. We intended to visit the tent camps to provide tents to families still without them. (“Tents” in most of the camps refers to shelters made of bed sheets and sticks. We are providing real tents from MCC.) While walking thru the first camp, people started to gather around us. The crowd became so large and pressing that our group was scattered. Because of the crowd, it was dificult to figure out how to get back to the bus. The people in the crowd were very angry and very loud. I could not understand what they were telling me, but they pointed to their stomachs, leading me to believe that they must have been very hungry. I was escorted to the fire station nearby for protection by Gito, one of our group members. As the crowd followed me and Gito, others in our group were able to get clear and back to the bus. General Conference is only 17 Days away! Hope to see you Acapulco! Recent Seminary Grad Interested in Small Church Ministry? Click the image below! Click here to download your business packet for General Conference!. Click here to check out the latest local church news and excitement! 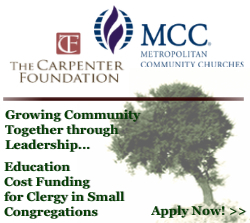 Email the editor to share what’s going on in your local MCC!